Installing the kit is a Very Good Idea. I checked my Mark II brake performance before I started by doing panic stops on a school running track; it took me about 27 feet (9 meters) to come to a stop from an 18 mph cruise. After I installed and properly adjusted the Mark III kit, I could actually lock the wheels up and skid to a stop in a little more than 12 feet (4 meters). This makes the bike much safer in commuting traffic. The Brompton brake kit comes with the two brakes and most necessary hardware, plus a yellow instruction sheet. This essay is a supplement to the yellow sheet; spend some time studying it before you begin. 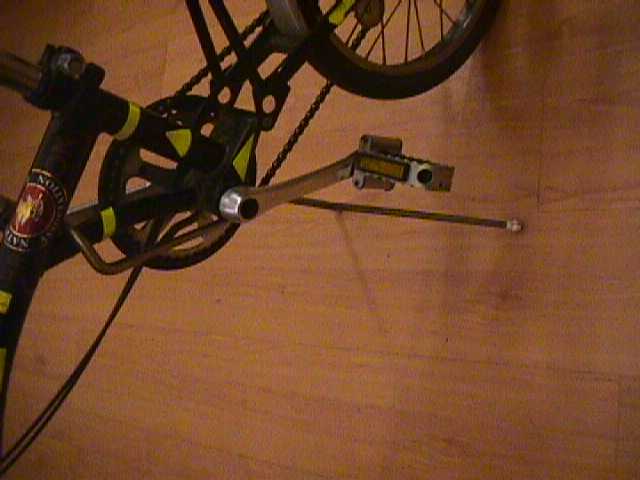 The pre-March 2000 Brompton bicycle has dull aluminum brakes with a cable tension adjustment screw on the brake bracket. The new brake sets are of bright aluminum and have the adjuster moved to the brake handle. Old front brakes and rear brakes are both simple side-pull models; new front brakes have a dual-pivot mechanism, while the new rear brakes are still side-pull, but with an enhanced leverage design. All "lefts" and "rights" in this document are from behind the assembled bicycle facing forward. From this vantage point the front frame hinge folds to the right. You must use a brake clamp to install the Mark III brake kit. These are available at most bike shops and mail-order bicycle part stores. You should also have a set of metric and English crescent wrenches, metric and English allen wrenches, pliers, nippers, and screwdrivers both Phillips and regular. 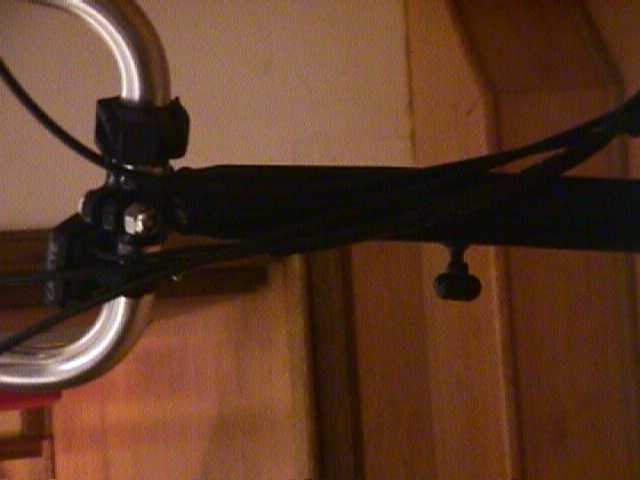 A stand to hold the bike upright when it is unfolded will make this project much easier. Your work space must be big enough to walk all the way around your bicycle, and preferably big enough to lie on either side. Good light is also a must. It took me most of a day to get the new brakes exactly right. A more experienced person could probably knock it off in two or three hours. Take your time; brakes are critical. First, secure the front calipers with your brake clamp. Its jaws should go over the brake shoe bolt ends. Pull on the brake handles to move the housing away from them; you can now remove the cable from the brake handle housing by pulling it up and over the handle. 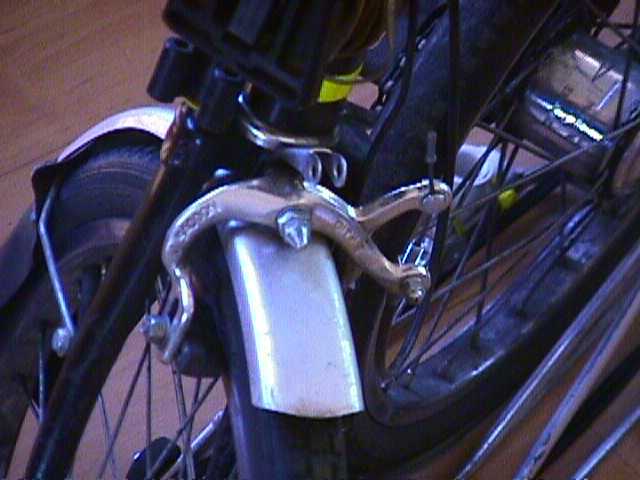 Remove the brake clamp from the front brakes and unscrew the center bolt to remove them from the frame of the bicycle. Locate the allen screw through the top of the brake handle. Remove this screw to take the old brake handle from the bike. 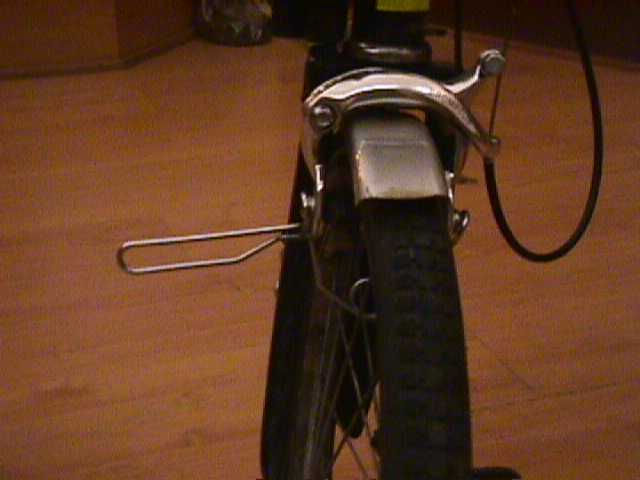 After you remove the cable from the handle, unscrew the cable wire securing screw from the front brake bracket. 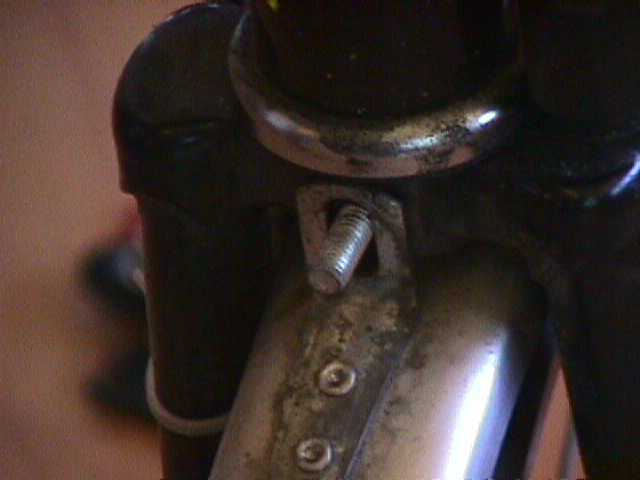 You can then remove the bracket from the bicycle by unscrewing the nut which holds the main brake bolt to the frame. Repeat this procedure with the rear brake to remove the old brakes from the bicycle. The stop disc on the end of the rear caliper main bolt is crucial to folding the bike correctly. You may need some extra washers for the rear if your bike lacks a rear cargo platform. I left the old handle brackets on, rather than going the extra step of removing the handlebar grips and replacing them. They work just fine with the new equipment. Save your lock nuts and washers as well; you will need them to hold the new brakes to the bike. I disassembled the gearshift control in order to thread the gearshift cable through the front brake cable gatherer, which you must also replace. If I did this twice, I would probably unhook the gearshift cable from the rear wheel to thread it instead. The gearshift lever consists of three main pieces: the bottom piece, the lever itself, and the top piece. The top piece contains the spring-loaded gearshift escapement. 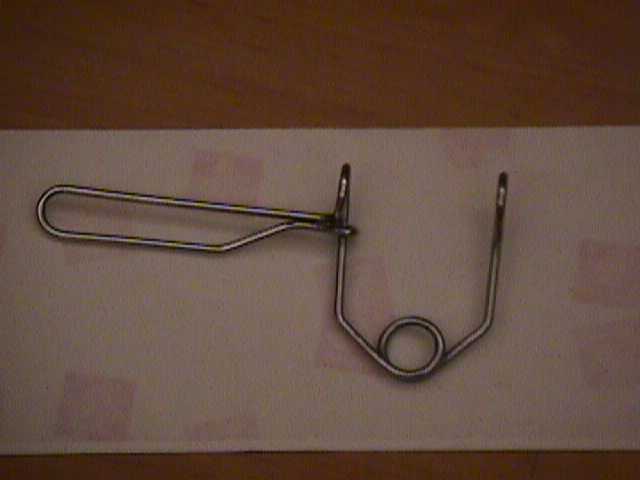 The bottom piece holds the two washers and helps attach the thing to the handlebars. Use a small screwdriver or a piece of flat steel to gently pry the end of the gearshift cable from the gearshift knob. Take care not to mar the soft plastic in this step. Reassembling the gearshift after pulling it through the front brake cable gather is gnarly and requires that you take your time and be gentle. Bolt the new brake calipers to the bicycle through the same holes as the old ones. Use the old lock nuts and washers to space them properly from the frame. Take care to install the aluminum frame washers with their curved sides on the frame. 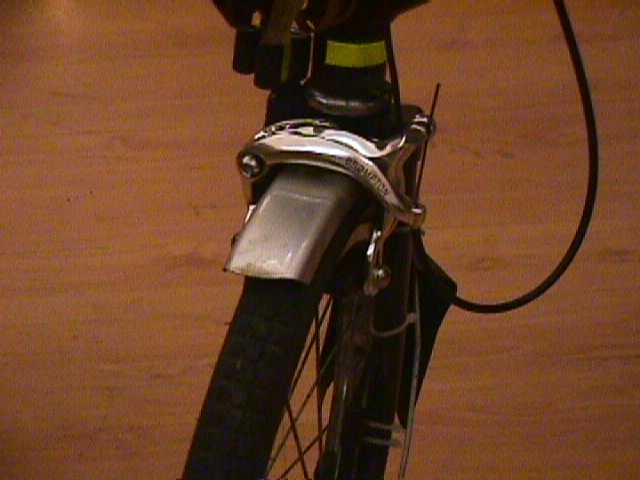 The single-pivot side-pull brakes in the kit are the rear set; the dual-pivot brakes belong on the front. The main brake bolts on the two calipers are different lengths, so they will not work well if mixed up. Thread the brake wires through the adjustment bolts, then through the brake cable casings. Assemble the front brake cable with the long part between the caliper and the cable gather, and the short part between the cable gather and the brake handles. Put the front brake cable on first, then route the rear brake cable and the gearshift cable through the new cable gather. All the cables must follow their correct routes. 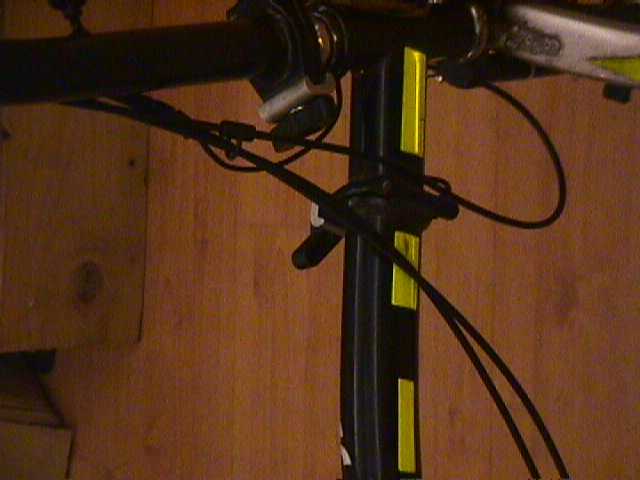 The rear brake and rear gearshift cables go to the left of the handlebar column, but to the right of the frame. 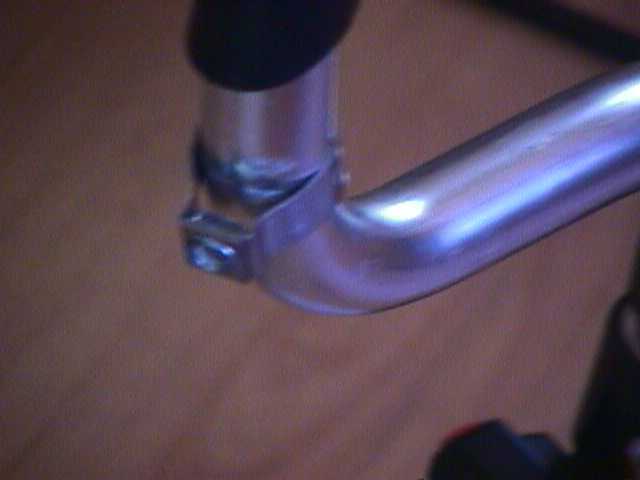 The front brake cable goes to the left of the handlebar column, to the right of the frame, and then through the bracket on the underside of the frame before it meets the front brake from beneath. If you don't get this right the bike will not fold, because the cables will hold it out of final alignment. After you think you have the cables right, fold the bike to ensure that everything is correctly assembled. 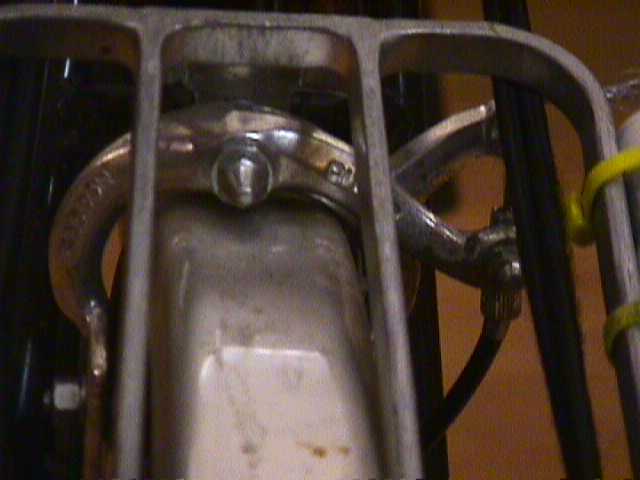 You must also adjust the rear seatpost folding stop, which threads on the rear brake main bolt. The seatpost should push it to the right when the rear frame pivot is folded, so that contact with it will tend to tighten rather than loosen the rear brake main bolt. Adjust the brake shoes vertically so that they bear fully on the wheel rims by loosening the allen screws that hold them and moving them up or down. Apply the brake clamp to hold the calipers shut and make sure the outer casing is properly seated in both the brake handles and the brake calipers. Pull the brake wire tight. Tighten the brake cable holding screw on the wire of the brake cable and release the clamp. It looked to me like the front brake cable screw takes a metric wrench, but the rear one takes an English size; a 6" monkey wrench will handle both well if necessary. When you release the brake clamp, the brakes should spring back to 4-5 mm off the wheel rims. Make sure that the rims do not rub against the brake shoes. If they do, reapply the brake clamp and let the cable off until you have just sufficient clearance. My front wheel is warped from a collision, so I sacrificed some braking efficiency to keep it free. Before you take your bike out for a test drive, make sure the rear hub is properly adjusted. Your Brompton documentation should have a procedure for this. Maladjusted Sturmey-Archer 5-speed hubs will skip. Re-check the nuts on the main brake bolts and the brake handles to ensure that everything is tight and proper. The new brakes will lock your wheels up if applied full force. This is a Good Thing, but it may take some getting used to at first. It's best to experiment with the new brakes in a safe place before heading out into traffic with them. After you're used to them, you may find that your average speed increases, because you're willing to go faster and brake later on hills and when approaching obstacles.